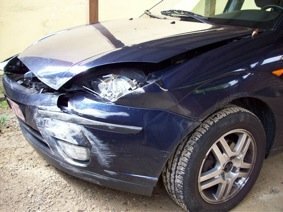 In 2010 I had a car accident while on my way to pick up one of my girls from the airport. I was just turning into a right bend when suddenly my car slithered out of control on the wet highway. It spun and banged against the crash barrier, turned on itself and crashed into the barrier again. After a few moments I got out of the car to take a look at the front, where there had been an impact. The damage looked impressive. Back in the car, I tried to start the engine. It worked, so I slowly headed to the airport. As soon as I saw my daughter, I told her what had just happened and together we went back to the car. It was only then that I realized that something felt terribly wrong. I was still in shock. As soon as I sat back in my car I started crying and tapping to try to get rid of the most severe anxiety, fear and shock feelings. Then I started the engine again and very slowly we drove home - frightened - but we got there safely. At home I realized how lucky I was. It was a miracle that nothing had happened to me. I looked at my car and felt grateful. I felt protected and grateful. Strangely enough I didn't feel angry or frustrated. I guess I realized in that moment how wonderful life is. How grateful I am for my life, my girls and all the wonderful people in my life (yes, you too :). Then I went for a one hour walk; the sun, the wind, the summer smell, everything was intense and very comforting. Back at home I thought I might work a little. No way! I felt strange. My legs, neck and head started hurting and I was shaking; so I kept on tapping. I sedated the triple warmer meridian, the gallbladder and stomach meridian and strengthened the spleen meridian. This felt very good. Sedating the triple warmer meridian evoked further emotion. But my legs felt relaxed, my neck as well, and I could smile again. But later in the evening I felt emotional again and just couldn’t put the accident into perspective; so I tapped again, had a good night’s sleep and woke up the next morning feeling refreshed and alive! Nothing had happened, it was just my car, right? Is it really only your car that gets spun out of control during an accident? I don’t think so; it is also your whole energy system that gets shaken up, disturbed, and loses it's balance. Even though I did a lot to get my energy levels back into balance, it took me several days to clear out all the feelings related to the accident. A couple of days later I had an appointment with my osteopath. She could hardly find anything that was out of balance and was very surprised how well I was doing. First of all because I want to highlight the importance of clearing your emotions when “bad things” happen to you! My osteopath was convinced that the wellbeing of my physical body is probably the effect of the emotional work I had been doing. It is also important to clear your emotions when little “annoying and frustrating things” happen to you, e.g. the strange behaviour of a colleague or a mate, the frustration following a missed plane, the frightening images you saw in the news, the computer that is not working, etc. Negative feelings and emotional stress disturb our energy systems and drain our immune systems. If we keep ignoring these feelings, they build up in our energy system and we then run a higher risk of developing various physical symptoms or illnesses like exhaustion, insomnia, bad moods, headaches, migraines, back pains, etc. So please keep your energy flowing if you want to maintain a good health, wellbeing and general happiness. The second reason for why I am telling you this is because “bad things” that happen to us are not always “bad things”. I know I created this accident, even though it was not conscious. Which point of view do you take when “bad things” happen to you?